Discussion in 'Magazines' started by The.Rock.Inc., Aug 17, 2009. OMFG...It's Bellaaaa...!!! but why the cover looks like that?! I feel sorry for the Dazed & Confused fans. Bit boring, but it's ok, like this girl. 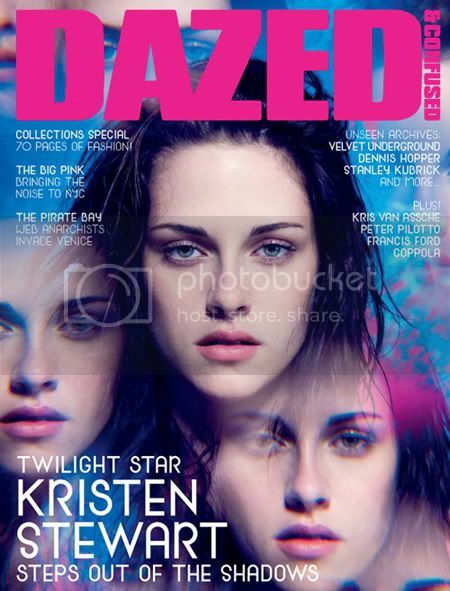 On the cover of September’s Dazed & Confused is the stunning 19-year-old actress Kristen Stewart, star of the global phenomenon that is the ‘Twilight’ vampire saga, and the upcoming ‘Adventureland’, directed by Greg ‘Superbad’ Mottola. Strikingly shot by David Sherry and styled by Dazed fashion editor Katie Shillingford, today’s hottest teen icon takes a break from playing Joan Jett in the forthcoming film of her life to talk rock'n'roll, rumours, and waging war on the paparazzi. In an exploration of the “Modern Archive”, Dazed also ransacks every vault, cellar and attic to present lost classics and forgotten gems – from amazing unseen 60s photography by Dennis Hopper, to forgotten films by the Velvet Underground, and Stanley Kubrick’s movie masterpiece that never was. The highlights of this season’s fashion collections are also presented with an archival twist, with contributors across the 70 pages including Terry Tsiolis, William Selden, Matt Irwin and Paulo Sutch. Dazed also spent a few hazy days in New York with The Big Pink, Britain’s most exciting new band, as they played their first US gig and hung out in the studio as they finished their keenly-awaited debut album for cult label 4AD. Photography by Jason Nocito. Also in this month’s issue, Matthew Stone documents Sweden’s internet anarchists The Pirate Bay as they invade the Venice Biennale; Peter Pilotto talk in depth about their latest collection; veteran director Francis Ford Coppola talks about returning to the screen; Nick Cave makes excuses for taking 20 years to write another novel; Major Lazer throw together the definitive autotune mixtape; and the legendary Grace Coddington remembers how she redefined fashion as we know it. Interesting to see Grace Coddington mentioned - the rest doesn't appeal to me though. What do you guys mean....Dazed and Confused (Led Zeppelin, 1969). It's psychedelic thing....so the cover is going back to its root references. As further exemplified by the Hopper story and whatnot. Wonder when they mean Grace Coddington redefined fashion as we know it? 60s? 70s? 90s? Don't particularly like Kristen, and don't particularly like this pic of her. But she looks okay and actually I love the caleidoscope effect in this. The blue works rather good together with the bright pink so...yeah, I like it. I have the same feeling with the title of the magazine right now. I like the cover and the colours used. Kristen, Grace Coddington, Dennis Hopper, Velvet Underground and Francis Ford Coppola. It sounds like it'll be good. Well, she certainly looks dazed and confused! Oh God...i can't wait to see...!!! I don't like it at all, the colors don't help either.